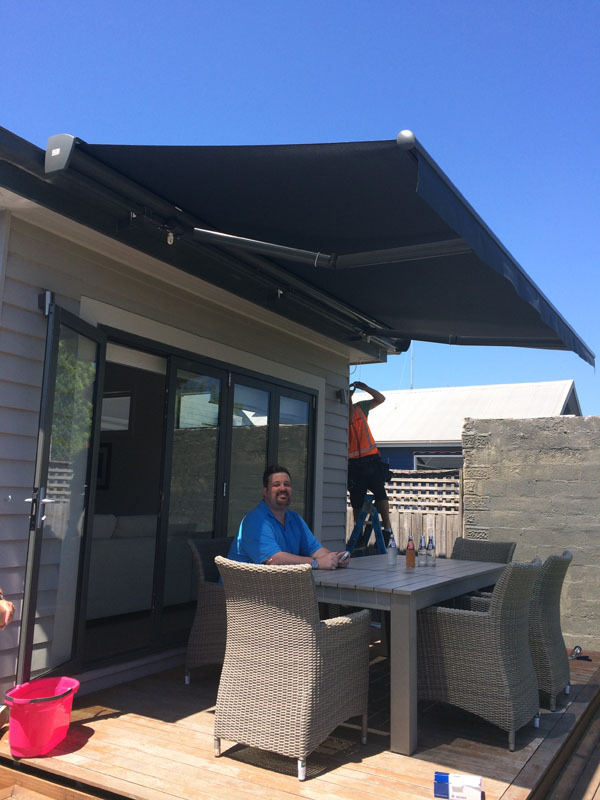 Folding arm awnings are versatile enough to be used in a variety of applications, from a residential backyard to a commercial café. They make the perfect window accessory for your business or home located in Geelong, Surf Coast, Bellarine areas. 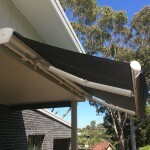 Folding arm awnings are great in small confined spaces, as they retract out of the way when not in use. 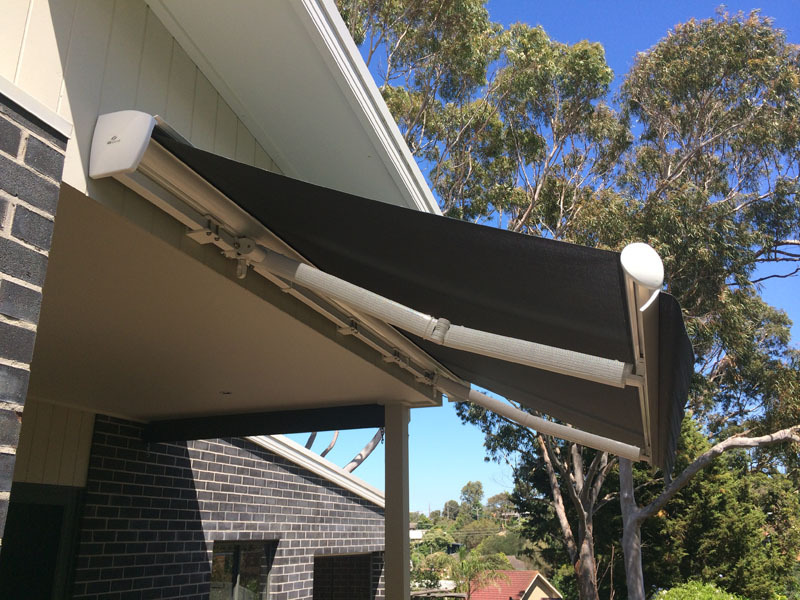 Choose from a standard folding arm awning unit; where the unit is fully exposed to the weather, it will require a pelmet/hooding for protection. 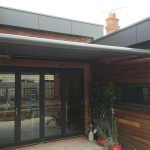 A semi-cassette awning is another option, where the unit is retracted almost completely in its own cassette for protection. 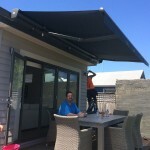 The final options are full cassette folding arm awnings (full cassette or low-profile cassette), where the unit retracts completely into its own cassette. Units can be operated by a gearbox and crank-handle system, or you can opt for an ease of use method with a motor and remote control. 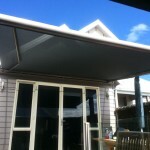 Note: all folding arm awnings over 6m in length should be motorised. 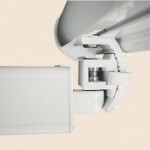 The folding arm awning units have optional extras available. 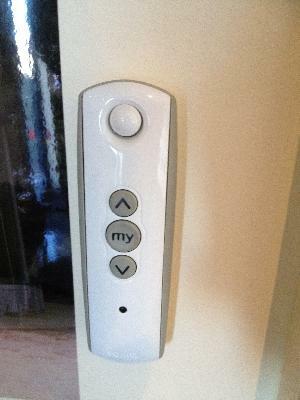 You can select a wind sensor, which recognises when it’s too windy and it will automatically retract your awning in for you. 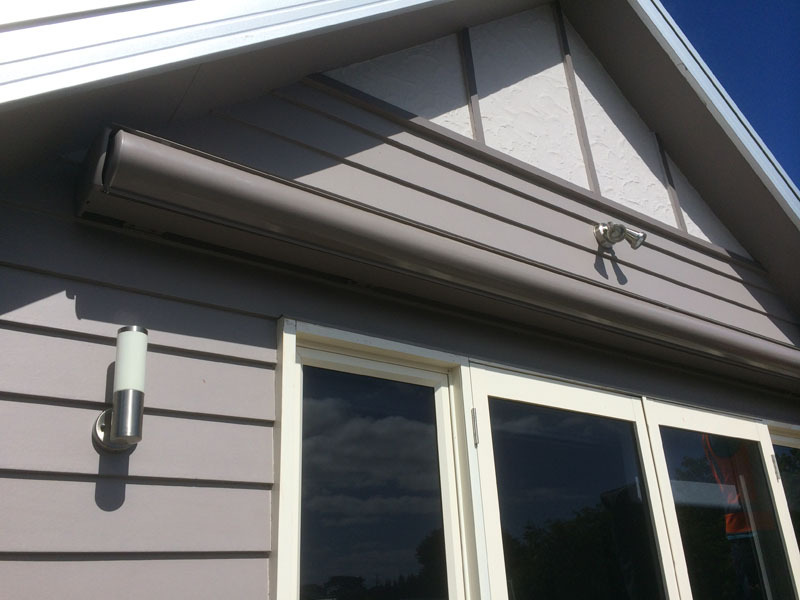 You can also choose to have a sun sensor, which works in the opposite way a wind sensor does; it will detect whether the awning is receiving too much sun and will extend the awning out automatically for you – these options are only available if your unit is motorised. 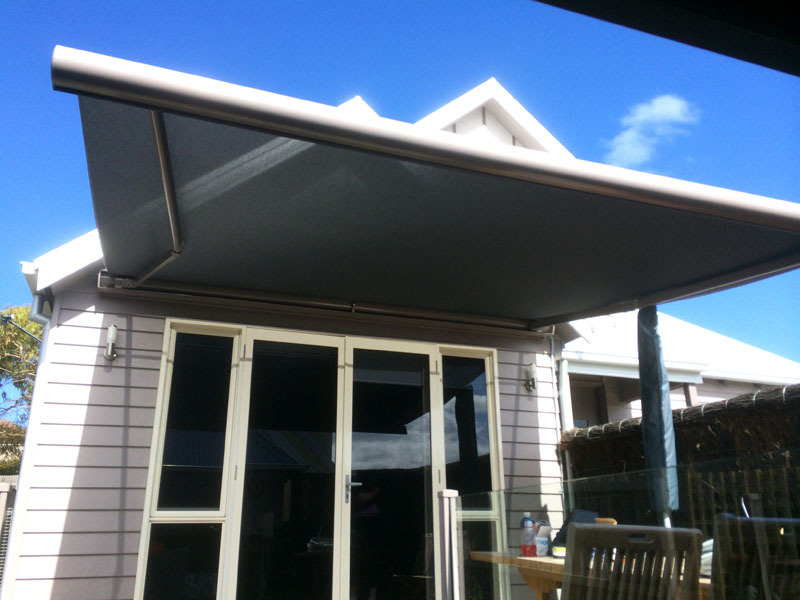 Folding arm awnings can project out to a maximum of 4m, and can be up to approximately 12m wide (depending on the model chosen). Fabrics available for the folding arm awnings are grouped into three types; mesh PVC (i.e. Vistaweave or Shade Elements), an acrylic canvas or the waterproof PVC. 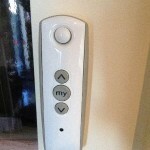 Each type has a vast array of colours and patterns to choose from. Titan awnings offer world-class quality, combined with user-friendly features and attractive elements. maximum projection 4.1m (pending on width). 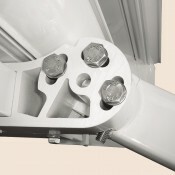 the semi-cassette type is closed on three sides which protects the awning fabric and mechanism from dust, rain and the elements when the awning is retracted. 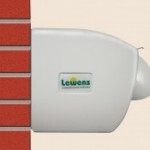 A classic of the series which utilises the best technology and getting the maximum use out of outdoor spaces. The Family Basic combines a stylish design with high quality materials and sleek construction, with a maximum width of 11m width and 4m extension, this design is suitable for almost any area. The Family Design awning teams outstanding technical features and modern design with the appearance of a cassette awning. Furnish and make outdoor spaces comfortable with the Family Design Semi-Cassette while retaining unmistakable style and unmatched quality. 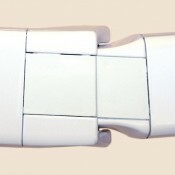 With a max of 11m wide and 4m extension, the Family Design-Semi Cassette is suitable for large areas. The Family Kompakt Full Cassette offers an elegant awning solution that is coupled with excellent technical features in this top-quality cassette awning that sits neatly against the wall. The Family Kompakt Cassette awning comes in two versions: closed on three sides with unique protective fabric casing. The Millennium is a low-profile full-cassette awning which incorporates advanced German engineering. The fully-enclosed cassette design provides optimal protection for the system while providing an aesthetic appearance to match in with the surrounds of modern architecture. 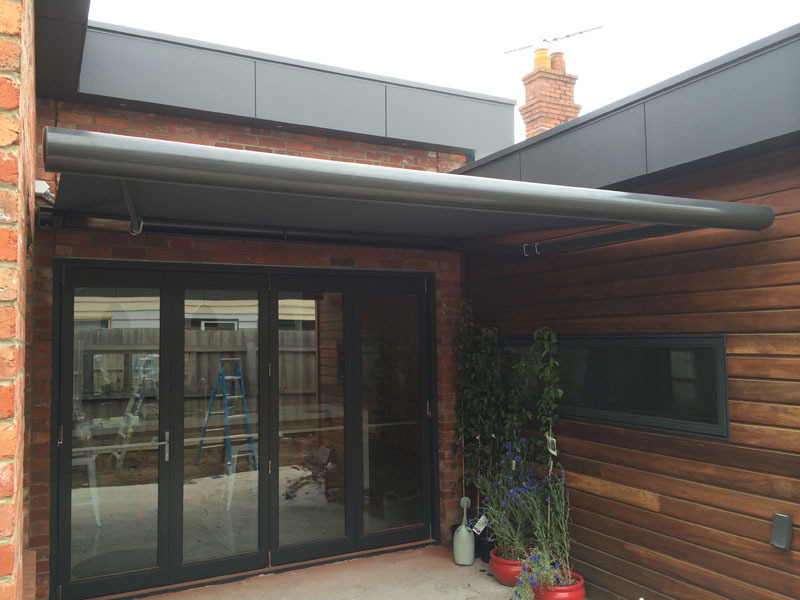 The low profile of this awning makes it stand out from other cassette awnings in a class of its own. 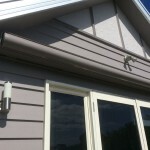 Surf Coast Shutters and Shade provides a professional advisory and installation service, with more than 34 years’ experience in the building industry, you are in good hands!